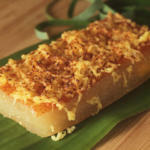 Cassava cake is made from grated cassava, coconut milk, and condensed milk with a custard layer on top. It is a very popular dish in the Philippines, where it is commonly eaten for merienda. It is also served during gatherings and special occasions. Grease pan or baking dish with butter and set aside. In a big, deep bowl, combine all the ingredients for the cassava cake and mix well until the sugar is dissolved. Pour the mixture into the greased pan or baking dish and bake for 45 minutes to 1 hour at 375°F/180°C. After the cake is baked, combine and mix all the ingredients for the custard in a bowl. Pour this on top of the pre-baked cassava cake and bake for another 15-25 minutes or until it turns golden brown. Watch this video to try a different recipe for cassava cake.